Nanaimo Yacht Club offers sailboat racing throughout the year in a wide variety of formats. There’s a season and a style of race for everyone. We hope you can come out and join us for some fun on the water. 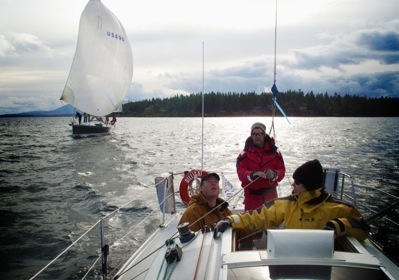 The Nanaimo Yacht Club has a keen group of sailors who like to get out on the water as much as possible to engage in friendly competition and hone their boat handling skills. We are extremely fortunate to live in a part of Canada where we can sail year round and are very happy to take advantage of this unique opportunity. Series racing takes place over 5 racing dates in each of the Fall, Winter and Spring seasons, often with several divisions and multiple “around the cans” races each day, providing a range of conditions as varied as the seasons themselves. And for those sailors who want to prove that they are not the weakest link on their own boats we have the Single Handed Series, which takes place every second Saturday of the month throughout the year. In addition to the multiple series races sailors in the Nanaimo area have two great NYC regattas to add to their calendars, the SIN Regatta in the summer and the Gyro Cup in the fall. These regattas attract racers throughout the Pacific Northwest and give us an opportunity to showcase the Nanaimo waters. And if that isn’t enough to satisfy your racing needs there are the ever popular two day races with an overnight stay in Gibsons Landing, the Day and a Bit Race in June and the Jack and Jill Race in October. Races are open to NYC members and non-members alike. If you don’t want to race your own boat, or don’t even have a boat, no worries as there are always skippers looking for new crew and no one is ever left standing on the docks when we head out to the races. Just show up at the competitors’ meeting on race days or contact us to get further information. As you can see, the Nanaimo Yacht Club racing scene has something for everyone. All it needs is for you to come out and enjoy what we already know; this is truly the best place on earth, especially out on the water!